James Kipsang Kwambai headed the 13,000+ field and beat defending champion David Kemboi Kiyeng in cold and wet conditions. Another 8000 took part in the supporting 10km event. Early leader Chani Hafid went through 10km in 30:56, followed a few seconds later by a group of 13. By 20km Hafid had a 26-second lead over a group of seven. He began to slow before 25km but it was only in the next 5km that the now four-strong chasing group closed him down, passing him by 30km. From 35km Kwambai made his effort and got away, with only Kiyeng hanging on a few seconds behind him for a while before trailing off. The women's race had no international representation. In a rare win by a non-Kenyan in a major marathon, Abdelkerim Boubker took exactly one minute off the event record writes Pat Butcher [the course records still stands at 2:10:55 to 2004 Olympic winner Stefano Baldini]. Boubker overcame cold and wet conditions but was aided by a considerable tailwind for much of the way and set a personal best in his second marathon. In the early stages it looked as if defending champion Raymond Bett, running at the back of the group of six, was simply biding his time, but he was first to drop off the lead group, at 23km. Boubker surged at 31km after the long undulating climb from 12km, and Sammy Chumba hung in longest. Daniel Gatheru dropped off the lead group early, but fought back to finish third. Boubker was well aware of the event history. "This is the highlight of my career," he said. "I prepared especially hard for this race. To win in this stadium makes me very proud". A native of Casablanca, Boubker plans to race next in Marrakech at the end of January. The women's race was competitive to within view of the finish at the Panatheniko, the antique marble stadium, venue for the 1896 Olympic Games, for which the marathon race was invented. Elfnesh Melkamu of Ethiopia and Kamila Khanipova of Ukraine ran shoulder to shoulder for 39km. Khanipova then went ahead and appeared to have victory assured, but Melkamu stormed back in the 42nd kilometre to catch and pass Khanipova. For a hundred or more metres it looked as if the Ukrainian would rise to this late challenge, but Melkamu strode out before they entered the stadium for the last 150m and won by six seconds. The pre-race celebrations included the lighting of the Olympic Flame in Marathon by Spiridon Louis, the grandson of the first Olympic marathon champion, after whom he is named. 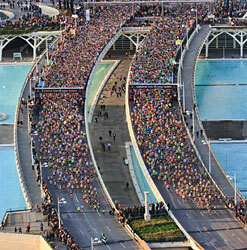 The concurrent AIMS Marathon symposium, in the town of Marathon itself, concentrated this year on Health Matters and Medical Services for Long Distance Runners, and included speakers from marathons in Brazil, Austria, Spain and Greece. Ennaji El Idrissi, a Moroccan who has lived in Genova since 1998 produced a major upset by winning the 25th anniversary edition writes Diego Sampaolo. From the start at the Central Square, in cool but sunny conditions, pacemakers led a group of ten at a steady 3:05/km pace, reaching halfway in 1:04:58. El Idrissi, William Chebor and Bacha Megersa pushed hard, breaking away from the rest of the field at 36km. El Idrissi, who won the Casablanca Marathon on 23 October in 2:12:55, launched a devastating kick at 40km, running the next kilometre in 2:48. 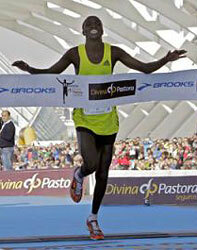 He romped home in the second fastest time ever run in Turin. The 25-year old Moroccan was talent-spotted by Italian coach SergioLo Presti and moved to Italy 13 years ago. After success in cross country and track running he turned to the marathon after being inspired by the story of Khalid Khannouchi and Stefano Baldini's 2004 Olympic victory. He plans to apply for Italian citizenship. From 5km Yuliya Ruban pulled away from the rest of the field, and was already 36 seconds up on Olivera Jevtic at 10km. She passed halfway in 1:13:39, 1:37 ahead of the group, still led by Jevtic. Silvia Svortsova went into second place by 30km but was overhauled by Raza Drazdauskaite as Ruban continued to pull away, missing her (wind-assisted) personal best by only 10 seconds. 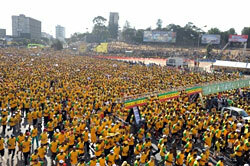 More than 3000 runners participated. Ryoko Kizaki won the first of the domestic Olympic qualifying races but because of unseasonably warm weather (up to 24°C) it is not clear if Kizaki will be selected writes Ken Nakamura. By 5km (17:00) the lead pack was reduced to six (Yoshimi Ozaki, Ryoko Kizaki, Kaoru Nagao, Salina Kosgei, Robe Guta and Hiroko Miyauchi) runners (plus three pace makers). Before 10km (34:06) one of the pace makers started to drift back, and at 12km another so that only Albina Mayorova was left to take the group through each 5km split in under 17 minutes. Salina Kosgei also fell behind as Mayorova paced the lead five through 15km in 51:08. She dropped out at 19km, well before the 25km mark as had been planned. Kizaki led, followed by Ozaki and Nagao, but the pace had slackened: from 15-20km took 17:37, and the time at halfway was a minute and a half slower than planned. As the pace slowed Mara Yamauchi came through into the lead at around 22km and dropped first Miyauchi and then Guta as she raised the pace from 17:56 (20-25km) to 17:18 (25-30km). At 31km Nagao made an effort, but it rebounded on her and she tailed off soon afterwards. Yamauchi, Ozaki and Kizaki passed 35km in 2:01:34 and ran together to 39km when Kizaki started to push and Yamauchi dropped back. Ozaki covered and made her own move after passing 40km in 2:19:17. Kizaki later admitted to nearly conceding at this point, but she clung on and reeled Ozaki back in by 41.6km and went past her to win by 17 seconds. The two remaining Olympic qualifying races, Osaka in January and Nagoya in March, will probably offer better racing conditions than Kizaki faced in Yokohama, and as a result the pacemakers in those races may be better able to reach their targeted distance, without the factors that damped down their pace in Yokohama. The 21st edition resulted in two home winners of this three-stage event, a repeat of 2005 result. Jonathan Balzan and Carmen Hili both took their 5th titles. Only Welshman Dale Rixon has a better series, six from 1992-4 and 1997-9. The field was limited to 100 Maltese and 50 overseas runners, resulting in 143 registrations and 136 starters for stage 1, 11.1km from Malta's old capital Mdina to Dingli Cliffs and back. The heavy rain and high wind cleared away for the duration for good running conditions. Balzan and Hili staked their claim early, winning this stage by a minute and two minutes respectively. The 133 starters for Stage 2, a 6km loop around the southern resort of Birzebbuga, enjoyed sunny and windless conditions. Balzan and Hili again took first places. Stage 3 got off to a beautiful sunrise at 7:00. Balzan broke away up the infamous Pembroke climb at 10km and never looked back, finishing over 3 minutes clear. The evergreen Carmen Hili, 40, held as much as a starting advantage but also extended it considerably by winning the 25km stage. Third-placed Romona Engerer remarkably stuck to the task despite her father's death on the Friday and his funeral on the Saturday. Nathan Farrugia, CEO of the children's charity Inspire, recently completed a fundraising tour of 27 Marathons in 27 different European Countries in 27 consecutive days. He ran the Challenge with his wife Deirdre, a Maltese Olympian and sprint record holder. 51-year old Nicky Farrugia finished in 3:13, although more accustomed to swimming. In 1985 he swam from Sicily to Malta (90km) and has swam around Malta's sister island Gozo. Next up is the London to Dover run, Channel swim and Calais to Paris cycle. This year's Challenge was dedicated to the late John Walsh, and his wife Carol, a previous four time "Challenge" winner. On a new course that starts and finishes at the renovated Jawaharlal Nehru Stadium and passes directly beside the iconic India Gate, the usual fast times were recorded in both men's and women's races. The pace was fast from the start as the young Milton Rotich took up pacing duties, helping to ensure the possibility of an event record. He eventually tailed off but still finished with a personal best, as others took up the running. The field thinned out gradually as the pace told, but four runners held together until the final stages before the finishing order was determined practically within the precincts of the stadium. In the women's race the pace was even faster in the early stages and the lead group thinned out to four by half way as some more favoured names dropped away. Lucy Kabuu forced the pace for most of the race with Sharon Cherop and twice previous winner Aselefech Mergia following closely. Mergia dropped off before she could make use of her usual fearsome finishing kick, leaving Kabuu to dispose of her final challenger, Sharon Cherop, as the stadium approached. Although no records fell in this 7th edition of the race the women recorded the 2nd, 3rd, 4th and 5th fastest times for the event, and the men 2nd and 3rd fastest. A group of 12 men, including pacemakers, kept together for much of the race, passing through 10km in 30:30 and halfway in 1:04:18. Only after 30km did anyone make significant moves, as Nicholas Kemboi accelerated and the defending champion and course record holder David Njadi strove to keep his title. Isaiah Kosgei and Francis Kibowen covered Kemboi's moves and at 41km Kosgei kicked hard to enter the specially constructed finish straight beside the Oceanographic Museum with a small but crucial lead. The Spanish-based Moroccan Hassane Ahouchar came through strongly, gaining five places after 35km and cutting nearly five minutes from his personal best. 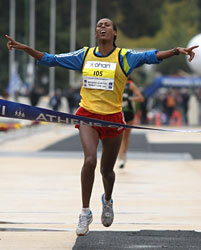 Likewise, behind women's winner Jimma Abo, Marta Esteban also improved her best time by five minutes.